Big data is being consumed by small packages like the iPhone 5 and Samsung Galaxy S3, according to a study released today, and now smartphone data usage trumped tablets for the first time. This surprise analysis, by network optimization solutions firm Arieso, flies in the face of the spike in tablets sales, devices that one might assume would be the more data-hungry. "This is pretty counterintuitive, but it seems the capabilities of the newest smartphones - not tablets - are unleashing even greater user demand," said Arieso Chief Technical Officer Michael Flanagan in a press release. "Once you move away from raw consumption statistics, the most remarkable finding is the way in which people use smartphones and tablets." 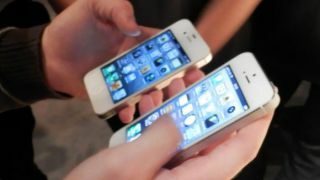 The iPhone 5 and Galaxy S3 split the top spot when it comes to downloads and uploads, according to the Arieso report that studied 125 devices. iPhone 5 users downloaded twice as much data as those with an iPhone 4S, and they quadrupled the amount of data consumed by iPhone 3G owners. However, the Galaxy S3 and Galaxy Note II generated so many uploads of things like photos and videos, they knocked the iPhone 5 back to third place on uplink data usage chart. Tablets did rank in this study, but placed fourth, fifth and ninth, when the original iPad and iPad 2 had dominated the second and third spots just twelve months ago. So it's even more surprising to see that data usage among Samsung Tab 2 10.1 users is number one, and has outpaced iPad users by as much as 20 per cent in the last year. This study, which comes on the same day that Apple reportedly cut its iPhone 5 screen orders in half, concludes that "for the first time in three years, [Apple's] dominance is being challenged". This may be just another sign of more Apple highs and lows to come in 2013.